27 May - Entry added in our caravan, parked in a Caravan Club site in the middle of Exeter Racecourse (numerous rabbits, but not a single race horse in sight!) at the end of a very warm, sunny day which the radio news tell us was the hottest May day for some 50 years. The journey went well, and we have had the afternoon to rest before we move on to Cornwall tomorrow. I went for a stroll with my camera and ended up watching a couple of these pretty butterflies on a patch of English Bluebells. 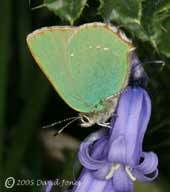 It is a Green Hairstreak (Callophrys rubi). Not a butterfly that I can recall seeing before, and certainly not one I will hope to see in the garden as it is a butterfly of scrubby habitats, hedgerows and heathland (which certainly describes this place). Although I didn't manage to photograph it, the upper surface of each wing is rather orange-brown in colour. 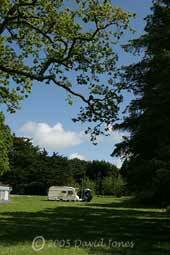 28 May - We are now on the Lizard peninsula, at our usual Pinetrees campsite, and it's a very pleasant, sunny evening. We've been visited by a Robin already, and earlier we had a low flypast by a Buzzard which was about 15ft above the ground as it went past the caravan. This picture is taken from the end of the wedge-shaped field which is surrounded by a mixture of pines and deciduous trees. That's us in the middle. 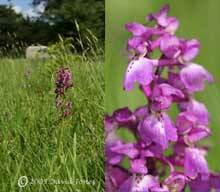 The area behind me as I took the picture is left unmown by Pat, the owner, until the wild Orchids have finished flowering. Today, they really show up in the bright sunshine, and although most are coming to the end of their flowering, a few like this one still have newly opened flowers. It's interesting to see that while the Triangular-stemmed Garlics back home were still in flower when we left, with a few exceptions the ones here have well and truly past that stage and have flopped, and are lying flat on the ground. 30 May - The weather is quite pleasant, although an annoying bank of cloud was stuck over us for some of the time today. Yesterday we made our first visit of the holiday to Lizard Point. It' always great to sit outside the Polpeor Cafe and have a 'cream tea' when the sun shines, looking out to sea towards the West, and watching the gulls and other birds at very close range as they fly over the cliffs. The Choughs are still feeding their chicks on their nest in a cave close by, and fledging isn't due until the 6th or 7th June. Hopefully we'll see them before we go home. On our way back to the caravan we stopped for a few minutes in a new car park that serves the nearby Goonhilly National Nature Reserve and listened to the first Cookoo that we have heard for at least a couple of years. We couldn't see it amongst the bushes, but it must have been very close to us. 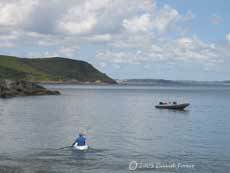 Today we spent the day in Porthallow Cove, our regular haunt and I took advantage of a calm sea to go out on my sit-on-top kayak. Along the bit of coast between the two headlands on the left of the picture are several small 'beaches' which are very difficult to get down to from the land, and caves that you can paddle into at the right stage of the tide. In the central background you may just make out Pendennis Castle (now home for the area's Coastguard), atop the headland that hides the entrance to Falmouth harbour. On this occasion I met up with a Heron (as usual!) but didn't get to see any of the Buzzards that I usually encounter. 31 May - A day of rest after yesterday's outing on the kayak. Also, I've been struck down with a fiendish toothache. In fact, it started before we came away, but seemed to be getting better, until today! I wasn't really in the mode for photography, but I did want to record the presence of several Cockchafer Beetles at the campsite today. 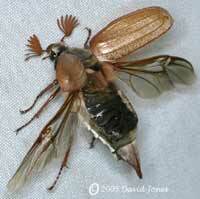 Also known as May Bugs these are quite strong fliers, although they don't seem to be particularly agile and have a habit of flying straight into brightly lit windows. This one was on the underside of our awning roof and was attempting to fly while still upside-down.